The Office of Service Learning supports the University of New Orleans’ commitment to developing student knowledge while serving the region, the nation, and the world at-large as it connects community engagement to the university curriculum. 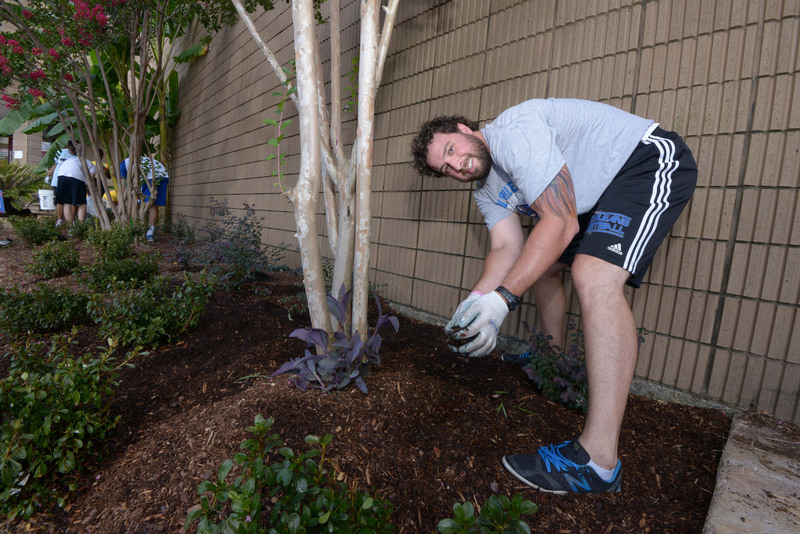 Incoming freshmen and current students can enhance their studies at UNO through community service. Also, visiting students from other universities can spend a semester in New Orleans doing something truly significant through service learning at UNO. Service learning at UNO endeavors to generate innovative solutions to challenges and achieve sustainable outcomes that benefit our partners and create a legacy of engagement with the communities we serve. Discover the rewarding experience of learning through engagement in one of America’s vibrant cities. Service Learning, a teaching and learning approach that integrates community service with academic studies, encourages current, new, and visiting students to become socially-conscious leaders. Through service learning courses and program initiatives the University engages students, staff, faculty and community partners to produce significant and sustainable benefits to the region and beyond. The University of New Orleans provides an academic environment that cultivates and graduates leaders ready to continue their service in the communities in which they live, work and learn. The Service Learning program at UNO was established through a generous and thoughtful grant from the Joe W. and Dorothy Dorsett Brown Foundation and is positioned for growth through the ongoing support of an expanding group of individuals and entities that believe in the value of this type of experiential learning. The Office of Service Learning and the newly formed Service Learning Network look forward to identifying new community partners and securing the funds required to refine existing courses and enable faculty, staff, and students to develop new courses and projects. For more information, please contact the Office of Service Learning at servicelearning@uno.edu or visit the offices at Room 2011 in the Administration Building to speak with program managers.